BIOsingle fingerprint represent giant leap ahead of conventional secured access control because a person's biometrics cannot be lost or given to someone else for temporary use. The authorized user must be physically present for access to be granted. 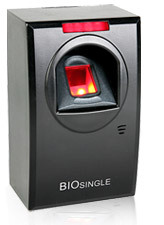 BIOsingle fingerprint recognition access control system provides the ultimate in convenience and performance for your secure facility. Users simply walk up and put their on th reader to be recognized. Our search algorithm allows for the convenience of "identification" mode functionality on huge user database, and it has 300 to 4750 templates. Products Range to support requirements from Small Office to Organizations with Multi-Locations. Various versions:smartSOFT ™ Professional Plus/Advance/Enterprise. Stores up to 4,750 Fingerprints & 5,000 event buffers. HID iCLASS & Mifare (13.56 Mhz) , HID Proxpoint & EM (125 KHz). LCD for Time & Attendance Display along with multi- tone buzzer. Configurable Operating Modes - Card only; Finger only; UID + Finger; Card + Finger; UID only etc. External Port Egress Switch N.A. Read Range UpTo 8 cms N.A. Inputs/Output 2i/p (Door status, Egress), 1o/p(Lock Open)/1Fire o/p N.A. Time Zone/Access Levels 7+1(Free Time Zone)/Unlimited N.A. Time & Attendance Software Classic & Professional N.A.